Freshwater is essential for sustaining human life, yet more than 780 million people lack adequate access to it. According to the Food and Agriculture Organization (FAO), global demand for this finite precious resource has grown at more than twice the rate of population increases over the last century. Meanwhile, the amount of global drinking water that's available is shrinking from the over-exploitation and contamination of groundwater aquifers, which nature cannot replenish fast enough. If current trends continue, the United Nations predicts that by 2030 global demand of freshwater will outstrip supply by more than 40%. In the U.S., the Environmental Protection Agency (EPA) estimates $600 billion will be needed over the next 20 years to address the country's aging water infrastructure, contaminated systems, and water shortages. Former President Barack Obama’s 2017 budget proposal allocated an additional $20 million over the 2016 budget of $260 million to fund research and development for water reclamation, conservation, and data-collection, as well as to find new ways to improve the quality and increase the supply of potable water. The growing scarcity of clean freshwater poses grave threats to public health, food security, the global economy, and international peace and security. However, as the maxim goes, every challenge is an opportunity in disguise. Innovative techniques to purify contaminated water, desalinate sea water, improve the efficiency of irrigation systems, and monitor distribution networks to reduce leaks are emerging as promising antidotes to these threats. When it comes to water management, "good information is key" according to Dr. William Samuels, who directs the Center for Water Science and Engineering at Leidos, which provides scientific, engineering, systems integration, and technical services to U.S. defense and civil agencies. Dr. Samuels and his team (Dr. Rakesh Bahadur and Mr. Chris Ziemniak) have spent decades developing ways to model and monitor water systems in order to detect and contain contamination. The fallout from two recent disasters would have been much worse if not for the Incident Command Tool for Drinking Water Protection (ICWater), software Dr. Samuels and his team developed that simulates the fate and transport of a contaminant. The model predicts when and to what extent contamination will reach drinking supplies further downstream, enabling officials to determine in real time when and for how long to shut off their cities' drinking water intakes. 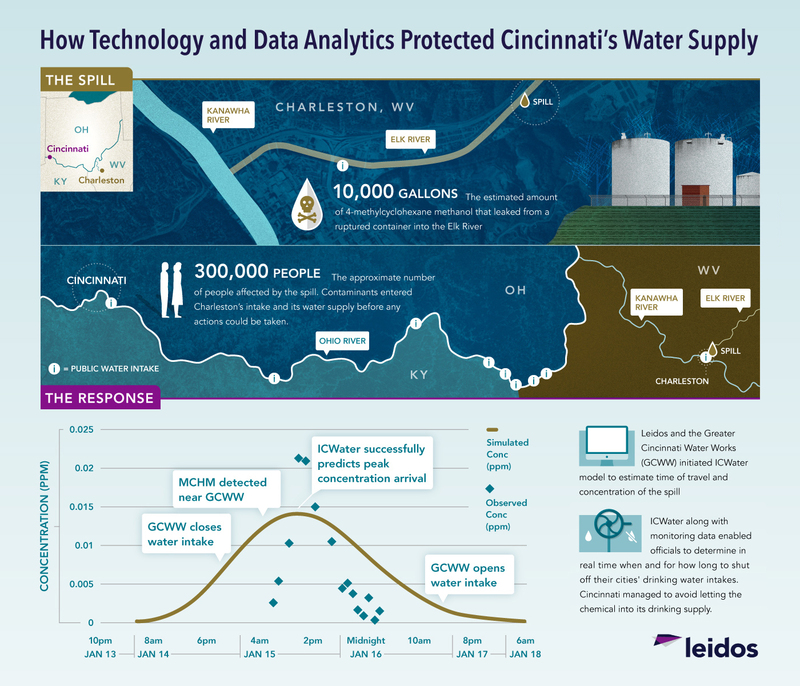 The software was implemented successfully in the wake of a 2014 chemical spill in Charleston, West Va., and in 2015 when heavy metals flowed from an abandoned Colorado mine into a creek that supplied potable water to several cities and irrigation water to farmland. This forensic tool can also pinpoint the location and amount of contamination when the source is farther upstream. ICWater's potential as a robust tool for surface water management, according to Dr. Samuels, lies in its ability "to perform rapid analyses of watershed connectivity at multiple scales anywhere in the country." Early adopters have successfully adapted the tool to fit their specific needs. Several branches of the U.S. Forest Service, for example, have employed it in various ways to assess and manage contamination stemming from wild fires and virulent tree pathogens, including identifying vulnerable public drinking water supplies. Meanwhile, the Defense Threat Reduction Agency uses ICWater for exercises and contingency planning, thinking through scenarios such as how to respond if a truck carrying pesticides were to crash near a lake that supplies potable water. Dr. Samuels and his team are currently working on optimizing the software for use abroad too. He explains that during the 2011 tsunami-triggered nuclear meltdown in Fukushima, Japan, ICWater was used to model the flow of radioactive discharge into the Pacific Ocean, but it took considerable time and effort due to insufficient data. “It was not as efficient as when we use the technology in the U.S., but in the future, we should be able to do this much faster," he says. Already, The Korean Ministry of Environment is adapting their spill response modeling system based on ICWater. Around the world, other technologies that can purify and desalinate water, monitor leaks to prevent waste, and make irrigation and water distribution more efficient, have also begun to play an important role in improving the quality and availability of water. M.I.T. researchers, for example, have learned how to convert the fog that abounds in some of the worlds driest regions, such as Chile's Atacama Desert, into water suitable for drinking and agriculture. By erecting stainless-steel mesh structures on high ground, they are essentially mimicking the way that desert plants and organisms harvest water from fog. The same process, known as biomimicry, is also used in Singapore to desalinate seawater at a far lower cost than traditional, energy-intensive desalination energy processes. Singapore also uses a sophisticated purification system called NEWater to reclaim wastewater for industry and even drinking, which has greatly reduced its dependence on imported water. Meanwhile, the Indian Institute of Technology Madras has designed a filtration system that uses nanotechnology to cheaply remove microbes and other contaminants that result in more than 1.6 million annual deaths linked to unsafe drinking water. At Leidos, one of the areas of focus is further developing satellite technology to “help understand the global water situation more quickly" Dr. Samuels says. Real-time imagery collected from space is useful in gauging how much water is available in a given area, especially in conflict zones and other areas where it is difficult to gather information on the ground. Based on rainfall, climate-change, and other weather-related data, it enables one to anticipate and prepare for droughts, among other uses. In places like the Middle East, where the land is arid and tensions run high, such information could potentially reduce the risk of conflict over water access through better planning. These are but a few examples of promising water technologies. Along with making water consumption practices more sustainable, they might prove crucial to averting looming water-related humanitarian catastrophes.